Santuri PS is located at 23°31'26.49"N and 86°51'18.09"E and 59 Km East from District HQ. 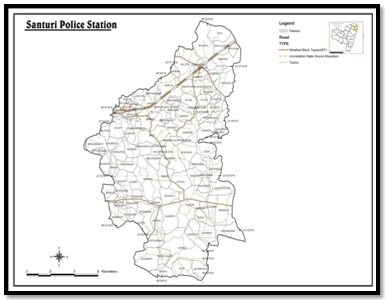 Santuri Police Station has a jurisdiction over an area of 179.69 sq KM having population 78,461 out of which 40,037 were males and 38,424 were females with 06 GP. This Police Station is under Purulia Sadar West Sub-Division and sharing border with Para, Raghunathpur PSs of this district. The PS has one Block and maximum people livelihood is very poor. Main earning of the area is cultivation. v. Population Density per sq km : 466 Per Sq. Km. 22. Name of the important doctors with contact No : Muradih B.P.H.C.- Dr. Manish Sharma, Santuri P.H.C.- Dr. Anirban Mukherjee, Balitora P.H.C.- Dr. Samiran Maji.